Let us do the work. You enjoy the pool. A backyard pool is a great source of fun and exercise as well as a gathering spot for the whole family. At Sierra Pool Treatment, we provide comprehensive pool services so you can relax and enjoy your pool. Family owned and operated, Sierra Pool Treatment has more than 14 years of experience in the pool service industry. 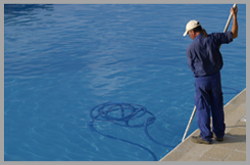 When you contact us for pool service, you can rest assured knowing we are a licensed, bonded, and insured company. Additionally, we possess a water chemistry certification. You can trust Sierra Pool Treatment to keep your pool functioning well and looking beautiful all season long. Call today for a quote on your pool service! Sierra Pool Treatment 2351 Sunset Blvd. © Sierra Pool Treatment. All Rights Reserved.